Like every time, I was reluctant to leave home as the time came closer. But I had no choice. I had some baggage to carry this time, and hence called an Auto home, to drop me at Kodungallur bus station. There was a KSRTC bus waiting when I reached the bus station – that was RNA164 of Thrissur. The bus looked tired, dirty and poorly kept. The bus was repainted over a year ago, but the shabby work left the bus really bad looking. The bus got crawling out of the bus station just past 1330hrs. The bus crawled out and they stopped the bus outside the temple for some time – while a private limited stop bus went ahead of us. We crawled out of the place – and kept crawling all the time. We reached Irinjalakuda at around 1410hrs – the crew of the private LS bus which overtook us at Kodungallur came and shouted at our crew – they were upset with the KSRTC bus being so close to them. Our crawl continued after that – for the first time, I was really upset sitting in a KSRTC bus. After the entire crawl, the bus finally reached Thrissur at 1450hrs – a good 1h20m for the 38km ride. Just as my bus was getting into the bus station, I got a call from Kallada enquiring about my whereabouts. I still had 15 minutes to go for the reporting time. I got off the bus and hurried to their office near the bus station (Sakthan Nagar private bus station). I was boarding from that office for the first office. It was a small place – around 5-6 chairs for passengers to sit. Some three passengers were already waiting there for my bus. The guys at the office did not even want to see my ticket. They were not interested in answering phone calls – I seriously did not like the way they worked. After some time of waiting, a tired but well kept Tempo Traveller came in for pickup. The vehicle was about 20 years old. I got into the van – we got moving at around 1510hrs. The interiors were in good shape – I was surprised at the level of maintenance. The engine was at ease even while the driver picked pace overtaking vehicles continuously. We were dropped at the Mannuthy bypass office of Kallada, at around 1519hrs. Just as I went into the office, the guy at the office checked my ticket and wrote “3942” on my ticket. “3942” is the registration number of the bus. The scheduled pick-up time for the bus was 1535hrs – we still had quite some time to go. The office had a fairly good washroom – I was surprised at that. Time went past quite quickly. While waiting there, the KPN B9R and the Kesineni B11R to Hyderabad went past. KPN did not have a pick-up there. I spent some time talking to the guys at the office – while talking to them, I heard the ever familiar multi-tone horn, and saw the white beast of Kallada rushing in. The clock read 1543hrs – a delay of 7 minutes, quite understandable for a bus coming in from Ernakulam. Boarding started immediately – about 6 passengers got in from here. My co-passenger was already there. A bollywood slapstick comedy movie was being played. It took some effort to find a place to keep my baggage – for some reason, I did not keep it in the baggage hold – I still don’t know why I did so. I had to keep one bag below my seat. The bus started off at 1548 – about 13 minutes late. Soon after starting off, the driver meant business – he was quite fast, but had a fairly safe style of driving. The bus did not rattle even when going through those horrible roads near Kuthiran. The interiors were very clean and looked fresh. Traffic was on the higher side – even on a Sunday! The movie was too loud and boring – I decided to concentrate on the road instead – four-laning works had commenced in the Vadakkenchery-Walayar section – journeys would get faster once the four-laning is complete. They’ve cleared trees and started levelling the land around the existing road. We reached Palakkad bypass at 1657hrs. The Kesineni B11R was standing there for pickup. It took some time for the passengers to get on board – the Kallada office was on the other side of the road. We started after pick-up at 1705hrs. By now the Kesineni had left. The run after Palakkad too was eventless. The movie got over now and the rear LCD was closed. Road works are progressing at an above average speed in the section – I am excited! We pulled up at Walayar RTO Check Post at 1733hrs. The attendant got off the bus and headed to the checkpost office, while the driver got off for a tea. Many passengers too used the break to stretch themselves and get some refreshment. No break was announced though. The driver was busy on the phone talking to the second driver and co-ordinating his pick-up location. It seems the second driver was not updated that he had to get in on the day. The driver also called up the Coimbatore office and updated them about our location. We started off from Walayar at 1745hrs – a 12 minute break. We stopped at Ettimadai (near Amrita campus) to drop a couple of passengers (1759hrs) and continued the run. The second driver was picked up from Coimbatore bypass (just past the Pollachi “exit”). We reached the Neelambur office of Kallada at 1832hrs (Neelambur is the place where Coimbatore bypass ends). The scheduled time here was 1820 – we were 12 minutes late. I was surprised to see Kallada having their office at such a remote place. The pick-up van was already waiting for the bus there – no wasting time waiting for the pick-up to arrive (KPN should learn from this). Quite a lot of passengers got off, and a similar number got in. We started moving from there at 1836hrs – that was just a 4 minute halt! Once past Coimbatore, the attendant came around distributing water bottles. He also gave a paper and asked all passengers to enter their name, age and contact number – requirements of an All-India Permit bus. Another movie was played now – this was a not-so-recent Tamil Movie. This was the first time I saw non-Malayalam movies in a Kallada bus. The driver was speeding very quickly, and kept proving that he means business. We had a pick-up from Karumathampatty (1848hrs). It got dark outside, and I focused on the movie now. I had seen this movie a couple of times earlier, but did not get bored. The driver kept hitting three digit speeds once on the four-lane section past Chengampalli. We turned right under the flyover at Perundurai bypass, and headed straight towards the fuel station. We reached the fuel station at 1942hrs – the crew did not even switch on the lights since they did not want passengers to realise its a break. I had to use the washroom – and hence rushed out. 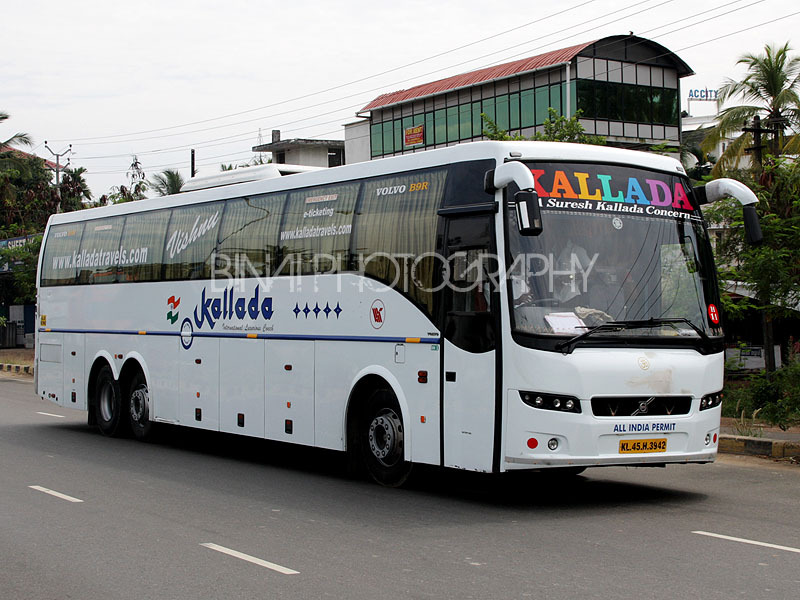 The Kallada Trivandrum B9R, which leaves Madiwala at 1400hrs was already there at the pump – that is just 5:40hrs for the distance during the day! The refuelling was fairly quick – a quick headcount was also taken. We started off from the pump at 1952hrs. The crew had told passengers that we’d be stopping for dinner shortly. It was a bit of a circus to get back to the highway – the town roads were all crowded despite being a Sunday evening. We stopped at Hotel Aryas, on the highway, at 1958hrs, for dinner. The attendant announced that all passengers should get off since they would lock the bus. The engine was shut down by the time I got off the bus. The service at the hotel was very lousy and slow. For the first time, I utilised the entire dinner break just to have food – I normally finish my food in 10 minutes and use the rest of the time to roam around the bus a bit. By the time I finished my food and walked towards the bus, the driver was already blowing the horn. We started off from the hotel at 2027hrs. We entered Chithode for a pick-up – it was quick. We got moving from there at 2038hrs. The movie got over shortly afterwards. The screen was closed and night lamps were switched on. I tried catching up some sleep. In the meantime, we passed by the Saravana Bhavan hotel, past the “Vaigundam” toll gate (near Sankari bypass). The Kesineni B11R and the KPN B9R from Ernakulam were standing there. Our driver (the same guy who drove from Ernakulam) kept maintaining three digit speeds all the time. There was a bit of traffic at Salem – mainly slow moving trucks. The bus just stopped and started at the Kallada office on Salem bypass – at 2127hrs. I caught up some sleep now – the ride was very sleep friendly – he was driving fast, but not rash – minimal use of horn as well. I slept for some time – I remember passing Krishnagiri (recognised by the recently re-directed flyover). I got a call from home asking my whereabouts, and I fixed up my pick-up as well. I was asked to call as we pass Hosur. I had another nice sleep (not really long) and woke up as we were passing by McDonalds at Shoolagiri. I did not sleep after that. There were no drops anywhere in the route. Even as the clock ticked past mid-night, traffic at the Attibelle toll gate was high! In the opposite direction, there was steady flow of KPN buses – mostly B9Rs and AC Sleepers. There was a minor scuffle between our driver and the guy at the toll gate – the guy did not accept our toll ticket (it was a multiple journey ticket) saying that it had expired. After the fight, the bus was allowed to go through without having to pay for another journey. The bus stopped at Electronic city for a drop at 0013hrs – interestingly, we were going below the flyover! My brother called me at the very same moment to ask where I was – I updated my position and told him that I’ll get off at Bommanahalli and asked him to wait there instead of going to Silk Board. Both of us were elated. There was another drop (near Singasandra) – did not notice time. A lot of passengers were now standing on the aisle to get off – I was surprised seeing the number of passengers getting off at Bangalore at such an odd hour. I was finally dropped at Bommanahalli, at 0024hrs. End remarks: The bus, KL-45-H-3942, was delivered sometime in August 2012. It had about 2.02lakh kms on the odo. This was my first journey in a KL registered B9R of Kallada – interestingly, all my journeys in KL regd B9Rs were in white buses!! The bus was kept really well – it did not rattle or make unusual noises. The exteriors had some dents – they were patched up though. The crew were very co-operative and well behaved. Pillows were provided to all passengers - It was comfortable to lay down watching the movie with a pillow under my head. The end-to-end ride took 8h41m – good timings for a bus that ran through Kerala during the day. The section-to-section timings too are impressive – 2h49m for Thrissur (Mannuthy)-Coimbatore, 5h48m for Coimbatore-Bangalore (Bommanahalli) and 2h57m for Salem-Bangalore. I loved the service – unsure if I’d repeat it though – since I reached home well past 0030hrs, and had to get up the next morning at 0530hrs to go to office – I was completely deprived of sleep. I had a nasty headache the next day and had a horrific time in office. So maybe I’d take the service when I don’t have the deadline the next morning. Will I take this service again? I am unsure. It is a good option when I have the liberty to go a bit late to office the next day. I’d surely suggest this service for anyone okay with reaching late in the night. Thanks a lot, Binai, for your wonderful blogs. I follow them all the time. I find it a wonderful way to keep track of developments in bus travel..